Last month I talked about job-searching your way into a career change, and also about how a single column was woefully insufficient for such a capacious topic. Since The Billfold’s September’s theme is career histories—and since my inbox is filled with variations on “I’m feeling stuck but I don’t know what to do about it”—I figured I’d dive back into the world of cover letters, applications, and launching yourself toward a more fulfilling job. When I get “help me fix my life” emails, they weigh on me. Even though it’s incredibly common to yearn for something different/better/more, each individual’s situation is specific and that makes these questions tough to address in a way that will be equally useful to other readers. Instead, I’m selecting a few questions (and comments) that are universal—both as starting points for some advice, and as a way of demonstrating to everyone else who feels similarly: you’re not alone. There’s a job I’m not really qualified for but I’d really love to have. How do I apply? One exercise I really like is to go through a job ad’s Qualifications and Nice-to-Haves list and pair each bullet point with at least one thing from your own experience. Challenge yourself to think broadly about your entire quasi-professional background, even if it feels like a stretch. What do you do if your resume is a series of short stints? Layoffs, toxic work environments, and taking jobs I didn’t really want (just to pay the bills) are all factors. Do employers really believe this is a sign of a bad work ethic? Is there any way to shape your resume that can either hide this, or explain it better? Actively trying to hide anything is generally a bad strategy on a resume, because if it’s something an employer’s likely to ask about, it’s ultimately pointless—except worse than that, since their whole perception is now inflicted with the element of You Tried to Be Sneaky About It. That said, a resume is not a deposition on everything you did for money during a particular period of time—you can omit anything that detracts from your strength as a candidate. The only downside is that you’ll end up with a gap where that job used to be, so you’ll have to do some mental calculus to determine whether the appearance of unemployment is preferable to listing a particular gig. For any shorter stints that you nevertheless want to include, try to justify the brevity as much as possible. Include parentheticals like “three-month internship” to clarify that a position was always destined to be temporary, or “job eliminated due to restructuring” to explain that you didn’t leave voluntarily, and so on. The toxic work environments and whatnot are trickier. Employers will balk if they see “March 2016–May 2016 (left because boss was a real A-hole),” no matter how true it may be. Remember, too, that your resume is a cumulative document, so as always, think about the big picture you’re trying to get across, and how each individual listing is contributing to that. I worry my work history is confusing, and for whatever reason I find that hard to explain clearly in cover letters. My attempts to write cover letters that will “pivot” me never seem to work. I detect a minor fallacy in this first sentence: the idea that a cover letter ought to explain your work history. That’s not the primary focus—your candidacy is. So don’t let yourself feel constrained by chronology as you’re trying to convey how qualified you are. I mean, you should ensure it makes sense, and smooth over any time jumps via transitions like “before that, I did X,” “later in my career,” and so on. But if anyone’s really confused about what you were doing when, they can look at your resume. In terms of “pivoting,” the more I think about it, most job searches have at least a soupçon of career-change about them. Even if you retain your title and general duties (which is already somewhat unlikely), every office has its own culture and norms—and for most people, “doing something different” is the main draw of a new job in the first place. Let’s pretend that making cookies—from scratch, in your home kitchen—is a stand-in for the job you have now. 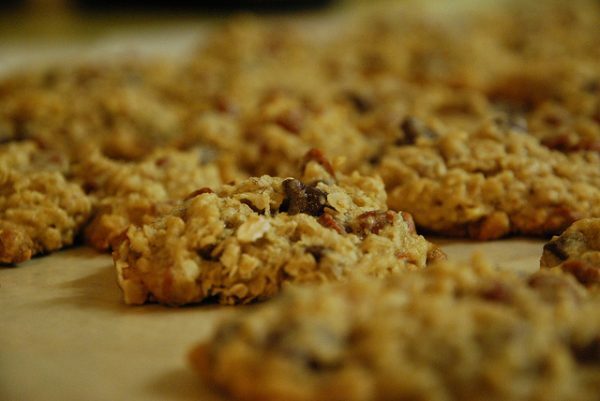 Your specialty is oatmeal/chocolate-chip/raisin/walnut. If you’re applying to make those same cookies for a new employer, your cover letter can be a pretty straightforward overview of your usual methods. And if you spot an ad for, let’s say, a white-chocolate/macadamia cookie-maker, it shouldn’t be hard to explain how your existing expertise has prepared you well—just a few ingredient adjustments and you’re all set. Now, what if you see a position you’d love to have—but it’s for baking cakes and fancy pastries. Not at all the same process… and yet! You can talk about how your skills are transferrable to this new task: the precision of your measurements (by weight, the best way), your careful attention to oven temperature, and your previous successes when tackling complicated new cookie techniques. After foregrounding the concrete stuff, you can mention your personal passion for pâte feuilletée and the fact that you make croquembouches in your spare time. After that you apply for a job making bolognese from scratch. That’s not even a dessert! But no worries; you’ve got this. Years of cookie-making have taught you the importance of mise-en-place, of adding ingredients in a specific order, of monitoring something as it comes together in case you need to course-correct—even if that means deviating from the recipe. You know about combining flavors and letting them harmonize in a unified dish; you’ve prepared food for a wide array of audiences and tailored your output to their specific tastes. You’re excited to apply these established skills to the realm of Italian saucery, and you suspect that your cookie-based background will allow you to bring a fresh new perspective to the role. Another thing I can’t recommend enough is having someone else review a cover letter before you send it out. If your editor friends are anything like me, they’ll jump at the opportunity—and if you don’t have any editor friends (which, well, why the hell not; we’re delightful), just give it to someone you trust will tell you if it is indeed confusing. No matter how smart, articulate, and write-good-ish you are, it’s difficult to talk about yourself and your abilities in a way that makes sense to the outside world, and an external perspective will help you make the most of the hiring manager’s limited attention. I feel like applying to jobs is a second full-time job. Please help. What, you mean the complicated routine I’ve outlined above takes time? And has to be repeated anew for each new application? Well, that’s a bummer. When job-searching—and when doing most things, really—you have to try to find the sweet spot between “enough effort that you don’t screw it up” and “so much effort that you exhaust yourself.” You’re producing documents designed to be read quickly, by busy people who are unable to appreciate that you spent 45 minutes dithering over a single clause. Once you’ve got a few tailored resumes and cover letters prepared, it gets easier. You can figure out which one is the best match for whatever new position you’re pursuing and then tweak it accordingly. You’ll probably find a few things to edit in the process (who among us hasn’t looked back at an old piece of writing and thought, “well that’s a weird phrase to have used”), but that’s an added benefit—it just means your materials will inevitably get better over time. Sure, under the following conditions: 1) You want to acquire the skills and knowledge you’d gain in the program, and 2) you have reason to believe it’ll improve your professional prospects BUT—and this is crucial—you’re not expecting it to magically transform your entire persona. (For more, via another extended food-based metaphor, see this thread.) You also want to take a hard look at your budget and whether or not you’ll be able to manage the cost. If you’re considering generic “grad school” as a placeholder for “opportunity to work toward a clearly defined goal, so I can feel accomplished instead of aimless and lost,” then—well, no. There are all kinds of paths toward self-improvement, so I’m hesitant to recommend an expensive one that will likely take you out of the job market for at least a year (or else make you ridiculously busy if you try to work at the same time). I say this, mind you, as someone whose career is in higher ed, and whose friend group is replete with folks who have advanced degrees. Going to grad school can be great! But not going to grad school is an equally valid option. How do I stop worrying and take more solid action to get myself in a better place? I’m not sure it’s possible to stop worrying—and if worrying’s complete opposite is complacency, I’m not sure you want to. You don’t want to feel worried all the time, though. You don’t want to feel stuck, or bored, or frustrated, or anxious about the trajectory your life is taking. On the professional front, that means scheduling regular check-in meetings—with yourself, to keep tabs on how you feel about your work. You should also be checking out job ads often enough to have a sense of what’s out there. Sometimes they’ll serve as as helpful reminder that your current gig isn’t so bad after all. Sometimes they’ll make you feel wistful and impatient, in which case “applying for new positions” is that solid action you’re looking for. But don’t forget about the personal front too. Try to untether your sense of self from abstract ideas of success and achievement. Give yourself permission to make choices that other people may not understand, but that make sense for you. I know this makes me sound like a whimsical barnwood wall hanging, but I mean it: make space in your life for the things that bring you joy. Businesslady is in her mid-30s and a successful professional despite her allegedly useless degree in the humanities (and a terminal bachelor’s at that!). Her day job is writing and editing for a nonprofit, and she devotes the rest of her life to playing video games, patronizing bars, and spending way too much time on the internet. She’s also the author of the “witty and entertaining” career guide Is This Working?, full of all-new material that you should totally read.